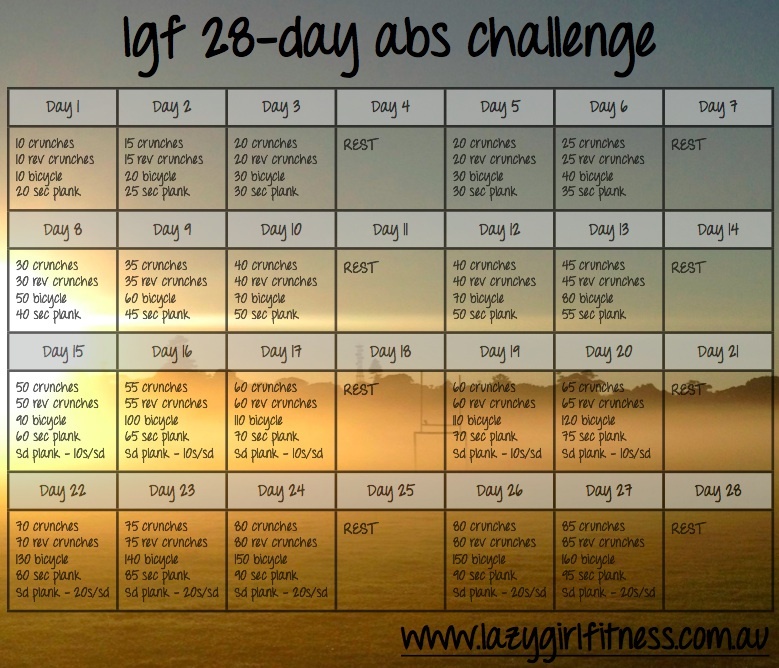 WE COMPLETED THE LGF 28-DAY ABS CHALLENGE!!! There were times along the way that I almost gave up hope of ever reaching the finishing line. Times when I forgot what it was like not to be planking, not to have a dull ache in my mid-section. But then the day finally arrived. It was over. As I said waaaaay back on Day 1, clean eating and a quality exercise regime were essential partners of the Challenge if you wanted to see your best results; and from a personal perspective, I am pleasantly surprised by the physical transformation. I may not have abs of steel yet, but I am closer than I was 28 days ago. I’m glad I took the before and after photos too, because I’m not sure I would have noticed the difference so clearly if I hadn’t been able to compare the two pictures. More important than the aesthetics though, are the improvements I have made in core strength. I’ve noticed my stability has improved, and my brother (who cursed his way through the whole challenge) said the same thing. It’s been particularly obvious to me when doing single limb exercises or running. Take a moment to think back on the challenge. At the beginning of the first week we were doing 30 reps with a 10 second plank. By the beginning of week three it was up to 190 reps with 80 seconds of planking and on the final day of the challenge we did a whopping 330 reps with 135 seconds of planking! The challenge might be over, but now I have proof of the results that can be attained when you commit to a little core work, I’m not ready to give it up. My plan is to continue with training my core three days per week, committing to five minutes each time. Very achievable. Hit me up below or on the Facebook page to let me know what you think. Do you have any equipment?? The only things with arms is that they are difficult to train without weights! And I’ll have some more up over the next few weeks! Read about you in my magazine, and I am so keen to tone up my stomach, i have gotton really lazy and put on weight, not happy! I want a firm body that i am confident with, so I will give your ab workout a crack. Hi Lauren! Thanks for visiting – how exciting that you found me in Cosmo! The 28-Day Abs Challenge is awesome – lots of people have had great results. Just remember to pair it with a good total body fitness regime and a healthy diet! Please let me know how you go!